Why is MellowPause better than HRT and Soy? How has MellowPause helped others? How do I use MellowPause? Menopause is the time at "mid-life" when a woman has her last period. It happens when the ovaries stop releasing eggs - usually a gradual process. Sometimes it happens all at once. Perimenopause is the period of gradual changes that lead into menopause. Although it can pass almost unnoticed for some women, others experience changes in mood, sleep, weight, appetite and concentration and may also suffer from uncomfortable and embarrassing hot flashes and night sweats. Menopause can be a stop-start process that may take months or years. During perimenopause, the balance between the hormones oestrogen and progesterone begins to change. Hormone levels fluctuate, causing changes just as they did during adolescence. Sometimes oestrogen levels decline, while at other times there is a condition called 'oestrogen dominance', which may be a factor in some of the more troublesome symptoms of menopause as well as PMS and complaints like PCOS. Induced menopause occurs if the ovaries are removed or damaged as in hysterectomy or chemotherapy. In this case, menopause begins immediately, with no perimenopause. The time after menopause is called postmenopause. The average age for a woman's final period is 51, but it can occur as early as age 40 and as late as age 60. Each woman's experience with menopause is unique. Some women experience very few changes during this time, while others report noticeable symptoms. Oestrogen dominance is thought to occur when there is a drop in progesterone production during menopause. While progesterone levels can drop to almost zero (due to the cessation or slowing down of ovulation), oestrogen levels only drop by about 50% during menopause. This is thought to lead to a condition called Oestrogen Dominance. It is useful to remember, however, that an alteration in the ratio between oestrogen and progesterone is a normal part of female aging and, in itself should not cause problems. Some researchers believe that it is the increase in female stress levels, as well as xeno-oestrogens (synthetic chemicals that mimic oestrogen in the body and found in pesticides, certain plastics, and the food and water supply) that have been responsible for the increase in troublesome menopausal symptoms caused by oestrogen dominance. Other sources of xeno-oestrogens are synthetic hormones found in the contraceptive pill and HRT. Xeno-oestrogens are thousands of times stronger than systemic oestrogen and can cause severe hormonal imbalances. Many naturopaths believe that the key to a healthy menopause is to keep these xeno-oestrogens out of the oestrogen receptor sites in the body, thereby encouraging healthy oestrogen/progesterone ratios. Black Cohosh is one of the more thoroughly researched herbs which contains phytoestrogens and is approved by the German 'Kommission E" - a body similar to the FDA. Because Black Cohosh has mild oestrogen-like effects it will bind to oestrogen receptors, without raising oestrogen levels in the body - thereby lowering the oestrogenic activity of the body. Phytoestrogens can compete with excess systemic oestrogen and xeno-oestrogens and therefore help to balance systemic oestrogen production. In addition, research suggests that Black Cohosh also suppresses Luteinizing Hormone (LH), high levels of which are responsible for hot flashes, among other things. Black Cohosh is one of the principle ingredients in our MellowPause remedy, along with Pasque Flower which is a well known tonic for the female reproductive system. In the case of severe menopausal symptoms, we recommend that MellowPause be taken together with Don Quai, which has been used for many centuries in traditional Chinese medicine. Don Quai is also well researched and apart from its phyto-oestrogenic properties, it has also been shown to be effective in the induction of progesterone receptor activity, thereby further balancing the oestrogen/progesterone ratios. The changes leading to menopause may seem much more intense than those during puberty. The intensity may be affected by a woman's feelings about aging, including her reactions to social judgments about aging. The more you know about menopause, the better prepared you will be to manage menopause-related problems. Dealing with menopause is best accomplished via a combination of diet, healthy lifestyle and alternative or natural treatments. However, many doctors are too quick to prescribe radical treatments such as synthetic Hormone Replacement Therapy (HRT) without fully educating their patients on the risks and side effects associated with the treatment. Recent studies have strongly suggested a link between synthetic HRT and cancer. It is therefore advisable that all women consider alternative methods of managing menopausal symptoms, before embarking on conventional HRT. There are many effective natural remedies as well as lifestyle changes that can result in improved systemic health and reduced symptoms of menopause. Healthy transition during menopause can be assisted in a variety of ways, especially by maintaining a healthy diet and lifestyle. Avoid foods high in salt and fat, eat plenty of fresh fruit and salads, drink at least 8 glasses of water a day and stay away from the coffee! Follow a regular exercise routine and make sure that you take time to relax and 'chill' every day. MellowPause is a proven herbal compound formula, clinically developed, and pharmaceutically manufactured. It provides natural remedies that work and eliminate the need to endure the risks and side effects of HRT. Remember, menopause is a transitional stage and not an illness and is therefore best treated in a healthy and supportive way. Conventional HRT should only be used as a last resort in very severe cases. The risks and long term effects of HRT are well known, and MellowPause is a much more comprehensive solution than soy-based products. While soy has been shown to have positive effect on hormone balancing, MellowPause's combination of ingredients make it effective for not only hormone balancing, but also as an effective treatment of other menopausal symptoms such as irritability, mood swings and insomnia. "I was very depressed and my moods were up one day and down the next. When I went to my doctor she said that I was starting to go through the menopause even though I was only 41 years old. She told me about this remedy and I tried it. I take it every day and I feel fine - not moody anymore, thank goodness!" "I have been taking your recommended herbs, Dong Quai, MellowPause and Femalite for a couple of months. I do have to tell you that all of my symptoms have totally disappeared. I probably started your course about last week of May. My sister is actually a Homeopath practicing in London and I will be visiting her in September and I can't wait to share my news with her! Thank you." "I used to wake up at night absolutely drenched in sweat! I've been taking Dong Quai and MellowPause for about two months now and I can really see the difference. I am not sweating at night anymore and I feel much calmer." Cimicifuga Racemosa (Black Cohosh) is a relaxing nerve tonic and has been used over the ages as a remedy for female gynaecological problems. Recent clinical studies done in Germany have confirmed that Cimicifuga is strongly estrogenic and that it is effective in relieving menopausal symptoms. It has as its main constituents triterpene glycosides, cinnamic acid derivatives, chromone, isoflavones, tannins and salicylic acid. Pulsatilla Vulgaris (Pasque Flower) is an important nerve relaxant and mild sedative, which is also a soothing analgesic for the female reproductive organs. Pulsatilla has also been used by patients trying to recover from dependence on benzodiazepine tranquillizers. Directions: 10 to 15 drops in a 1/4 glass of water three times daily or as prescribed. MellowPause gets to work quickly and noticeable results are usually obtained after a few doses, sometimes sooner. It usually takes a little longer for reduction in common hot flashes to be felt. However, with regular use MellowPause will continue to provide ongoing benefits to the menopausal and perimenopausal woman. 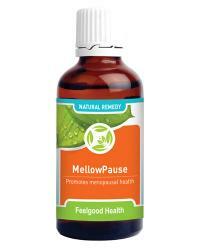 One bottle of MellowPause will last 25-30 days. Hormonal balancer plus remedy to address all symptoms of menopause! Remedy for all menopause symptoms plus tonic for added energy and vitality! Lessen heavy periods while addressing all menopausal symptoms!